Lime and coconut along with pineapple make this a special tropical flavored cake. I found the original recipe for Pineapple and Toasted Coconut Cake in Lauren Chattman’s book, Cake Keeper Cakes, and I adapted it slightly to include lime. I couldn’t get that “Coconut” song out of my head—Put the Lime in the Coconut and mix it all together—do you know that Harry Nilsson song from way back? It’s a catchy tune with good advice; lime and coconut go well together! Lime and coconut flavors will take you to an island paradise-- all in a cake! Prepare a bundt pan with baking spray and dust with flour. Preheat oven to 350 degrees F.
Toast the coconut on an ungreased baking sheet for 3-5 minutes, tossing gently so that it does not burn. In one bowl mix the eggs, sour cream, vanilla, lime and lime zest. In another bowl combine the dry ingredients—flour, baking powder, baking soda, salt. Cream together the butter and sugar in a large bowl with a mixer for a few minutes. Alternate adding small amounts of the egg mixture then the flour mixture until all is incorporated. Fold in the pineapple and the coconut. Recipe is adapted from page 128 of Cake Keeper Cakes. Welcome to #BundtAMonth March, the virtual bundt-baking get together hosted by Baker Street and Cake Duchess. The theme this month is TROPICAL so let’s get baking and transport ourselves to the islands, away from the doldrums of winter and into the fresh flavors or the tropics. Give this Lime and Coconut Bundt cake a try and you’ll be ready to book a vacation to a warm beach where you’ll sit with a pina colada in hand…but oh, I digress. Back to the cake! Years ago my son and I competed in a Crisco All-American Pie competition with a Lime in the Coconut pie. We didn’t win, but we thought we should have. These are unbeatable flavors. I would love a slice of this cake right now. I think you should have won too! Lime and coconut pie would be great right about now. I’m here in Seattle where it’s raining and cold so I totally need to be transported today! Love that you used lime, coconut and pineapple! Oh wasn’t the pineapple in the bundt amazing?! Love this recipe! Yes, I loved the pineapple in the cake too. Hope you see the sunshine soon! The song popped into my head as soon as I read your title. It is a great combination of flavors plus sweet and tart. Great cake to share for the tropical event. And, yes, I am still singing this song in my head. When it accidentally pops out and my boys hear me singing they wondered what was the fuss about the lime and the coconut! Love the addition of lime with the coconut, this would be fabulous!! Lovely looking bundt!! Thanks, Tara! The lime was a nice flavor this month with our tropical theme. Looking forward to next month’s baking already! This is one delicious combo. I love the addition of lime. Beautiful! Thanks, Jennie, this was a fun theme I thought, we could all use a vacation to somewhere warm and sunny, right? Lime, pineapple, and coconut are certainly a winning combination! Thanks, Heather, this was a fun cake to bake as it was different from my standard chocolate cake for sure. Thanks, Paula, your cake was lovely this month. The texture was beautiful. Oh yes, this is a great cake book to have, so many ideas for all types of cakes. Thanks for organizing us all for another great month of baking! It’s so much fun to think of ideas for next month already! I suggest we both start doing the diet thing …after I try to make this cake. 😀 Lime and coconut are my favorite! ha! Yes, any diet I would ever consider would have to start AFTER my next piece of cake. Have a great weekend! Yum, this looks gorgeous! 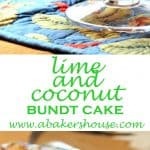 I love the sound of lime and coconut cake! Thanks for reading and, yes, this was a nice combination. I really enjoyed it and ate half the cake before I knew it! I have never baked a bundt cake before. These flavors are saying I should and soon!! YUMMM! Ansh, you need to try a Bundt cake–one of the easiest desserts to serve a crowd and so pretty too! Or, if not, I’ll bake one for you! You and I were on the same wavelength with coconut and lime this month but I LOOOOVE that you added pineapple to yours! What a great idea! Now I want to make your version. It sounds super tropical. Your cake is gorgeous this month! I think the coconut and lime combo is an instant tropical feeling. Looking at the snow out my window and wishing I were on a beach now! 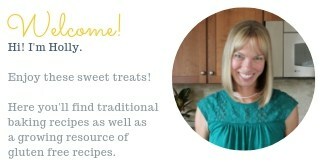 Thanks, Laura, I find when my kids don’t eat the cake that there is just more for ME!! What a great month of Bundts, it’s fun baking together! I absolutely LOVE making bundt cakes! They are so perfect and wonderful and yours look so wonderful. After yesterday’s snow storm I most certainly need transported. This cake sounds incredible Holly. Love the flavor combination. I wonder whatever happened to my bundt pan that I got for a gift about 30 years ago….hmmmmm. I think I will rename this, “Caribbean Vacation” cake. 🙂 I think we could all use a slice of Caribbean vacation right about now. 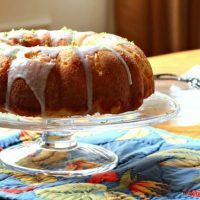 The tropical flavors sound so good together and the cake is so pretty with the sprinkle of lime zest. Thanks!